Another fairytale retelling from the amazing Marissa Meyer? A must read! Heartless takes place in Wonderland, before Alice fell down her rabbit hole, and tells the story of how the Queen of Hearts became oh so heartless after all. Let me start off by saying that it has been years and years and years since I read Lewis Carroll’s Alice in Wonderland. And I have yet to read Through the Looking Glass, though I did just discover the copy I own does have both stories in the same edition so I really must make the time and give them a read soon! It’s also been years since I watched the Disney movie and I’ve only seen bits and pieces of the Tim Burton version. So my knowledge on what is canon down the rabbit hole is somewhat hazy. Needless to say, the magic of being transformed into that world I loved so much as a kid was astounding! The game of croquet complete with flamingos and hedgehogs, the tea party, the cards! And so many characters to recognize like the Cheshire cat, the mad hatter, why even the King, were all just as I remembered them and done so well. Of course we meet our main character, Cath Pinkerton, as she embarks on her reluctant journey to the throne through her courtship with the King. Cath wasn’t always an easy character to love. I felt for her when everything seemed to be falling apart and not going her way, but I also wanted her to stand up for herself a little more than she did. The thing with Heartless is, it’s a back story for a future villain so you already know somewhat how it will all end. Did it make it any less devastating? Not really. But it didn’t keep me from hoping it could somehow be different. One of my favorite aspects of the story was Cath’s love for baking. She made incredible desserts and the author had a way of writing about them that made my mouth water, wishing they could be sitting in front of me to consume myself. And the other addition I loved was Jest the court joker, and his Raven. Jest was witty, smart, and fun! Without him the story wouldn’t have held as much magic as it did. 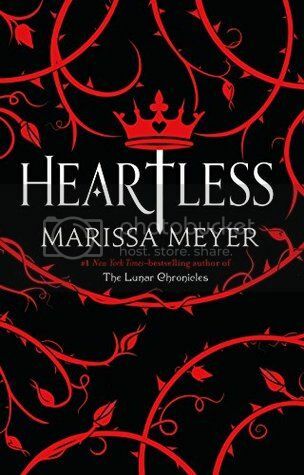 Heartless was my first Alice in Wonderland type of retelling and it won’t be my last. Definitely a must read for fans of Wonderland! Glad you liked this so much. I think it’d be hard to warm up to Cath knowing she’s a villain later but this sounds like another great one by Marissa Meyer. Glad you liked it!! I was beginning to feel like a black sheep because everyone I know who read this didn’t like it all that much– and I LOVED IT!! I thought it was so fun and had just the right amount of romance, action, storytelling, etc. I loved how it made nods to the Disney movie and the classic books. I loved how I knew she wasn’t going to be with Jest, but I was still hoping I was WRONG!! Great review and OMG the food!! I was SO hungry while reading this one! Great review! I also wanted Cath to stand up for herself at least a little…but I still really liked the book!